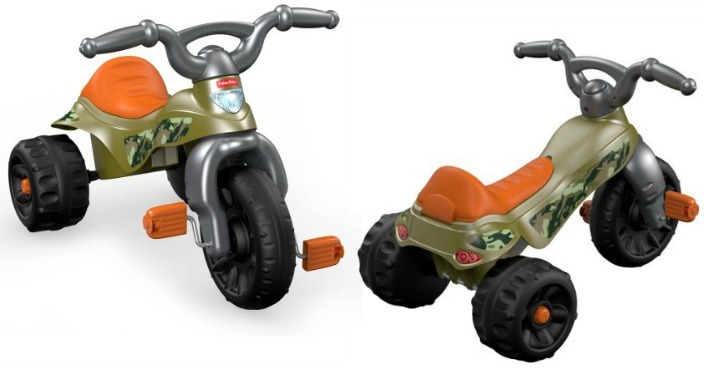 Fisher-Price Tough Trike Just $19! Down From $40! You are here: Home / Great Deals / Fisher-Price Tough Trike Just $19! Down From $40! Right now you can get this Fisher-Price Tough Trike for just $19 (Reg. $40) at Walmart! Here’s a kid-powered tricycle that’s as fun, tough and adventurous as your little one. The big foot pedals get the good times rolling as kids cruise along on this trike that’s all tricked out in a cool camouflage pattern. The rugged tires, stable wheel base, and easy-grip handlebars make it easy for even the littlest riders to get moving – and the big seat ensures that their ride is comfy wherever their travels and adventures take them. Shhhh…there’s even a secret storage compartment under the seat to keep toys and snacks hidden until little drivers pull over for a rest stop.